In reality there are so many different ways that we can learn how to attract girls that it’s often confusing working out how to best spend our time, resources and energy. Over the years I’ve come to realise that the quickest breakthrough that we can achieve is with our dating strategy, followed by our self confidence and finally our lifestyle choices. When we are able to methodically look at our dating lives, we are then able to see areas of vast areas of improvement, where we can gain better results at an exponential rate. Our dating strategy is how we go about meeting new women. It’s everything from our very first words, how we go about exchanging details with them and all the way through with how to get a girl to meet up with us again. One of the main areas that men like to improve their dating chances is with the ability to stop and approach attractive women during the day. We simply see a girl that we like and we walk over to her and start a new interaction. 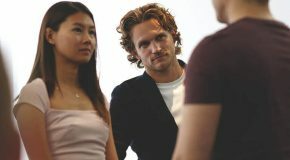 In reality many of us lead busy lives so the thought of being able to approach and interact with any women at any time is highly alluring, which is why it forms a solid part of our three day training course. Once we have a solid structure of how to attract girls, the next step is to develop our inner confidence in a way which allows us to be more relaxed as a person. Self development ranges from having specific things which we can say or do before we approach new women, meditations to help us to be more relaxed through to powerful visualisations which help us to overcome our fears of approaching new women. Once we get the blend correct between the correct strategy and growing in confidence we find that our results with women increase dramatically because not only are we conveying the right attributes about ourselves, we are also relaxed enough to go with the flow in a new interaction. The final step to becoming more attractive to women is to work on our lifestyle. The aim of this part of our coaching is to create a way of life where women are drawn into our world on a daily basis. When we compound the right dating strategy with self confidence and then add in an attractive lifestyle we find that women will often approach us and begin to start new interactions. It’s about living a life which is exciting to us so that other people want to join our party. In reality we can choose to improve any of these areas of our life and we’ll find that with the correct guidance, if we hire a dating coach, that our results with women will improve significantly. As a dating coach expert, over the years I’ve found that clients of ours tend to meet their life partner when they are only a short way into their goals and life journey. Hey Buddy!, I found this information for you: "Why Hire A Dating Coach? Written By Gary Gunn". Here is the website link: https://www.socialattraction.co.uk/hire-a-dating-coach/. Thank you.